Jon Miles is an Arizona activist. He is a member of the Communist Party USA. In 1991 Jon Miles signed a Solidarity Day 2 Salute in the Communist Party USA paper People's Weekly World from Tucson. Most signatories were known members of the Tucson Communist Party. One of the signatories was Jon Miles..
Jon miles, Tucson, was one of those listed. 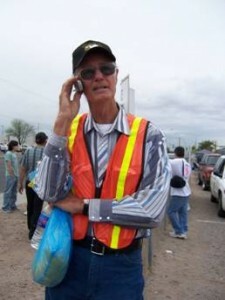 Jon Miles, Veterans for Peace, Tucson, was on the list. In 2010 Jon Miles turned 70 years old. Jon Miles is involved in the Derechos Humanos, Veterans for Peace, Salt of the Earth Labor College and he also organizes and coordinates "peacekeepers" for marches and events. This page was last modified on 21 July 2018, at 00:33.